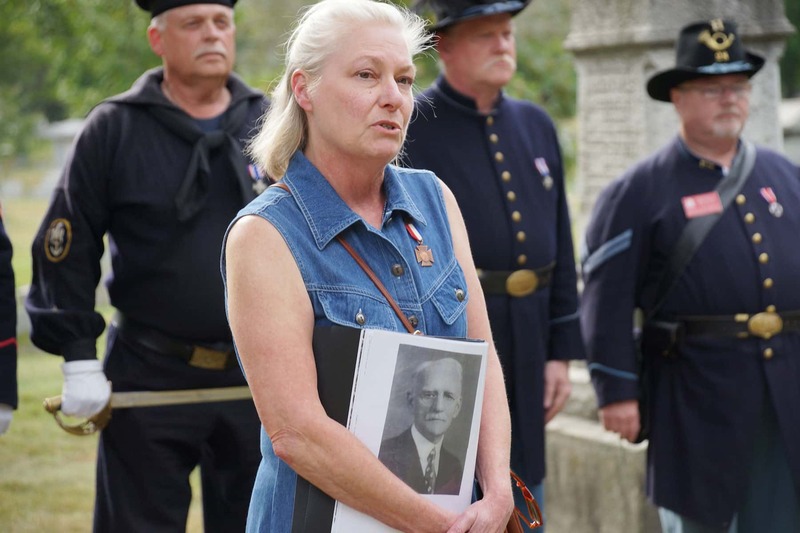 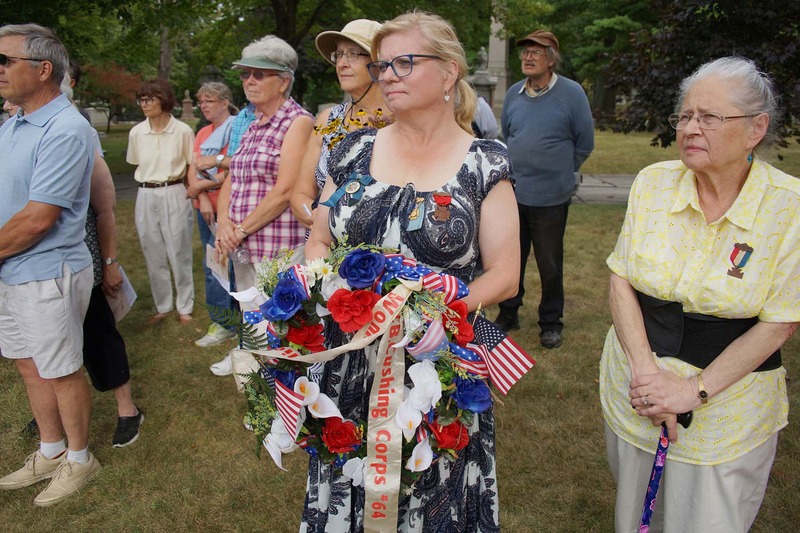 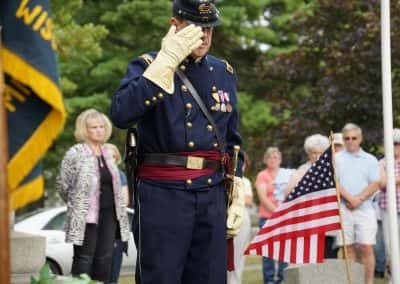 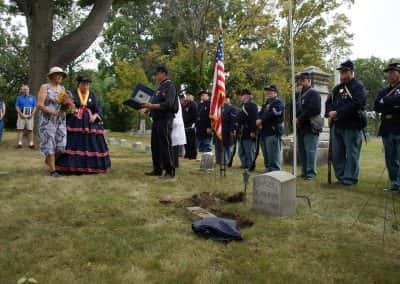 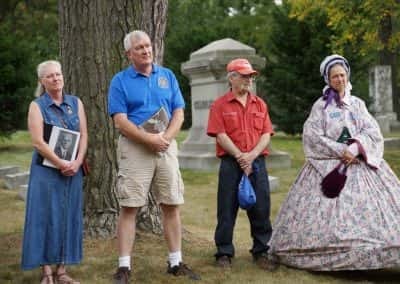 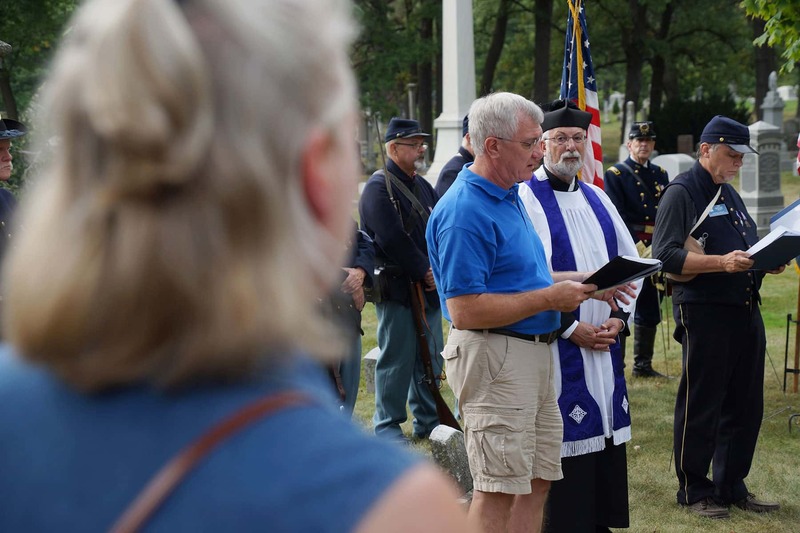 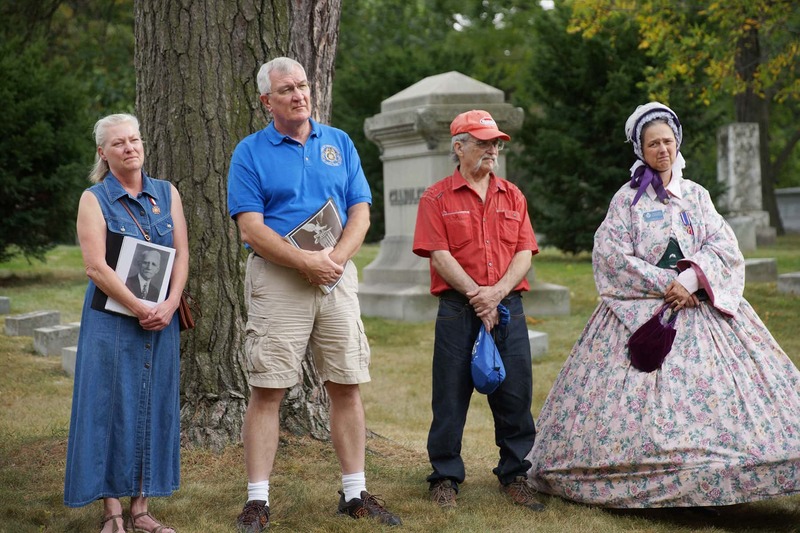 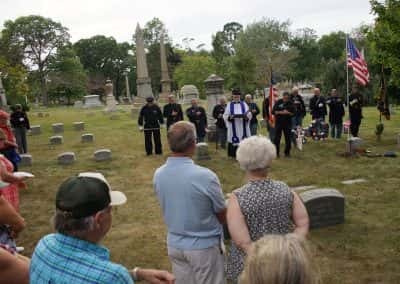 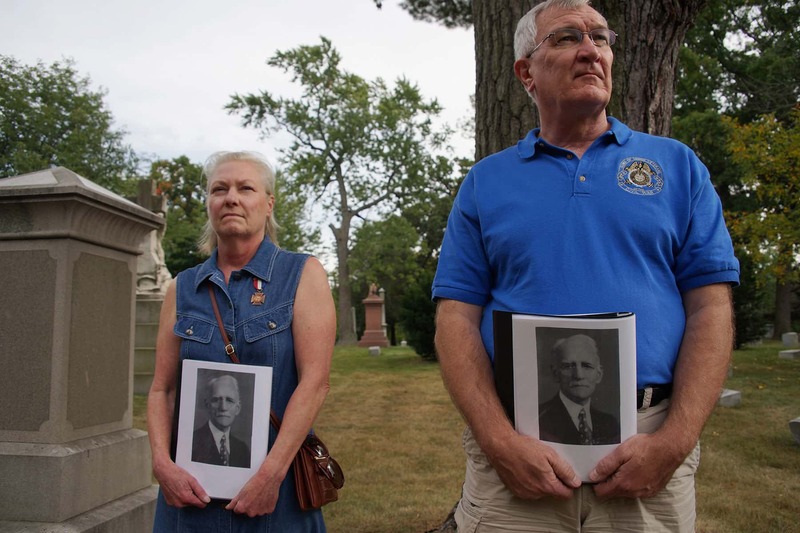 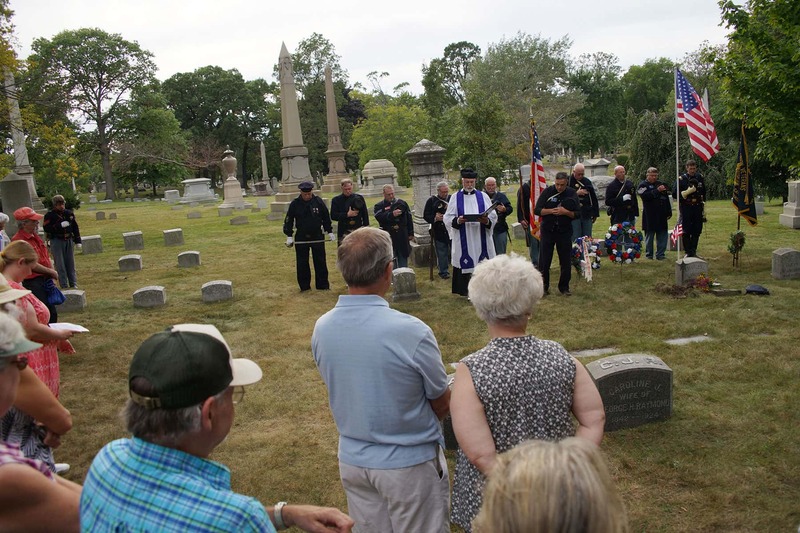 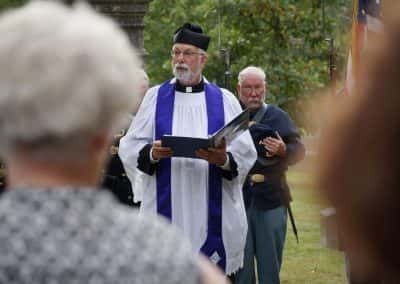 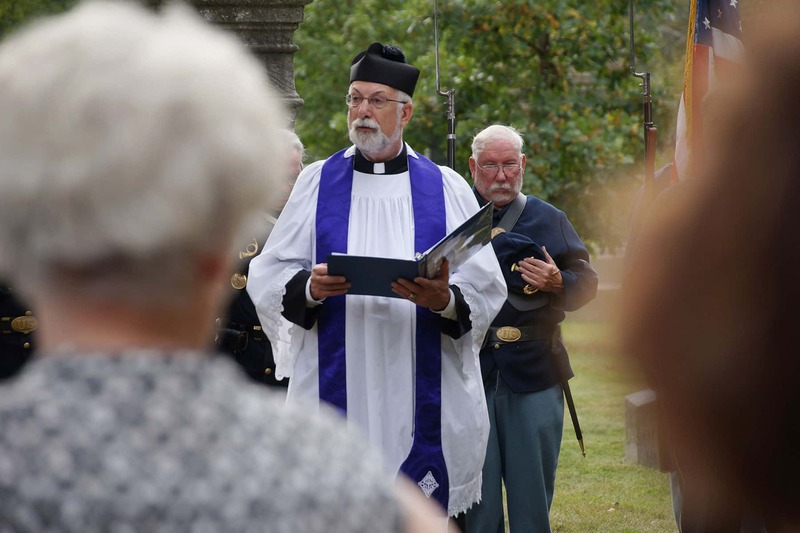 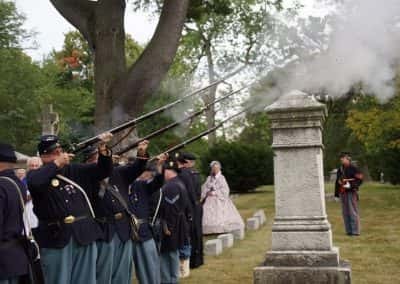 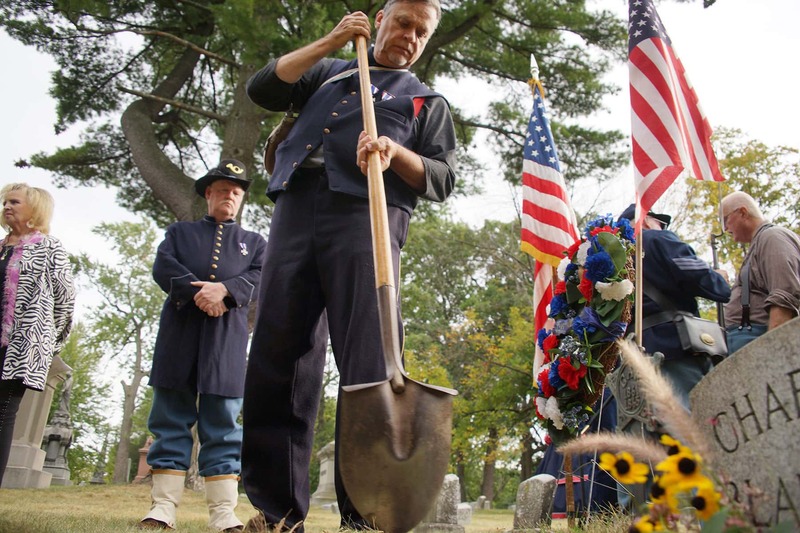 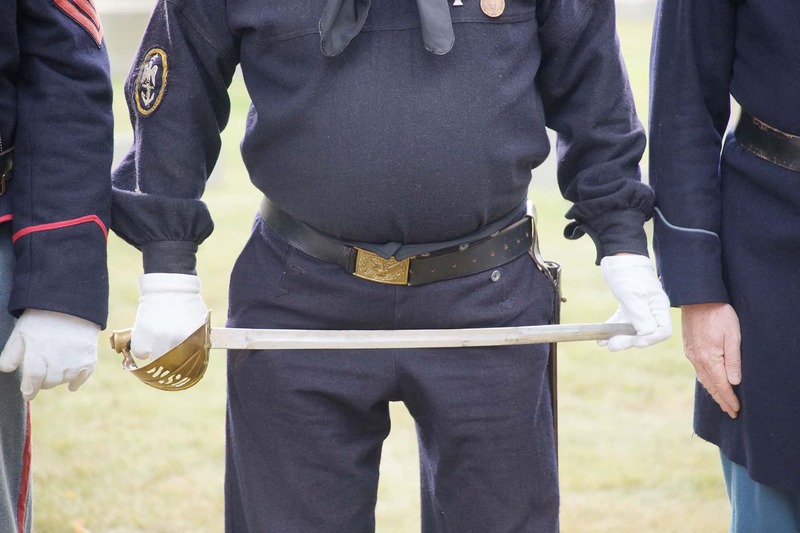 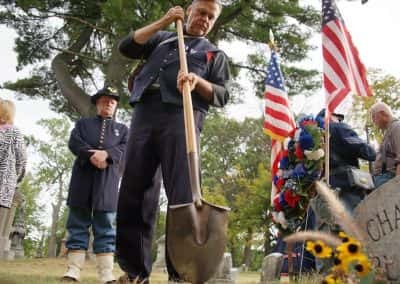 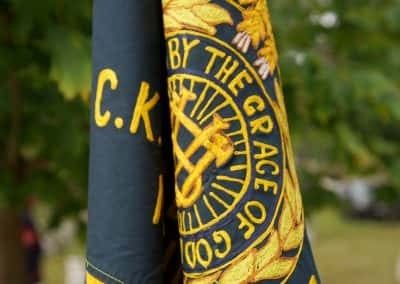 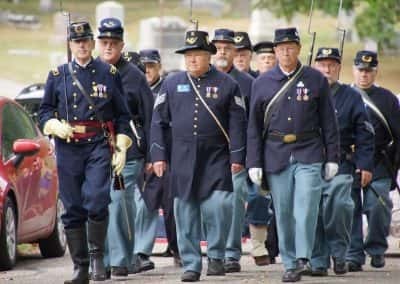 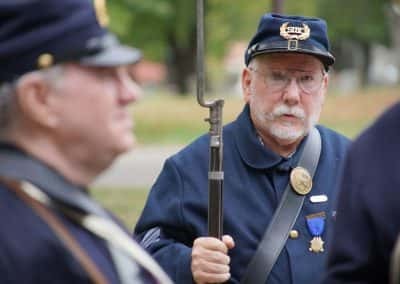 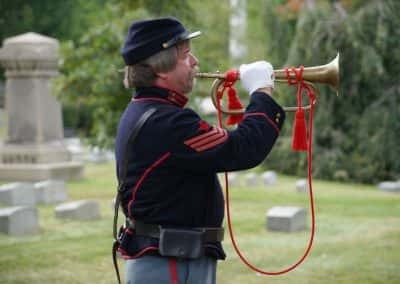 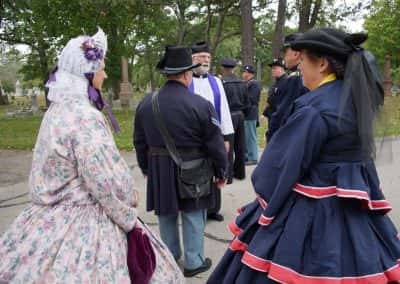 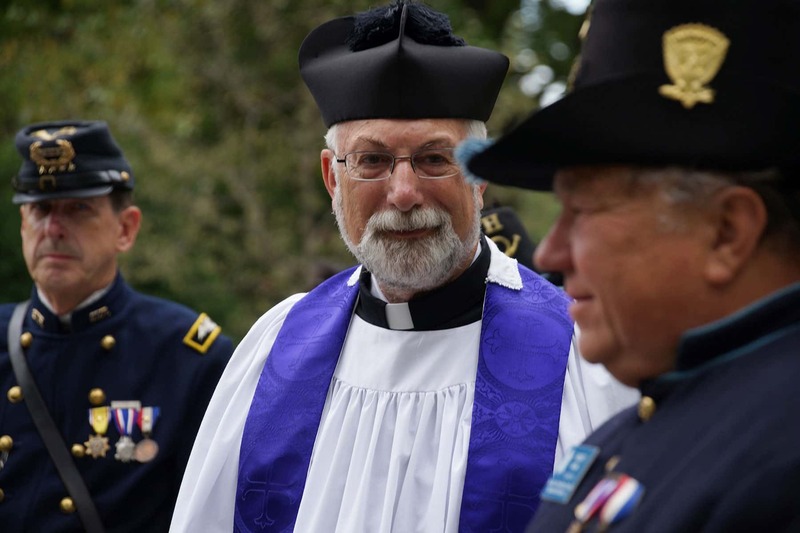 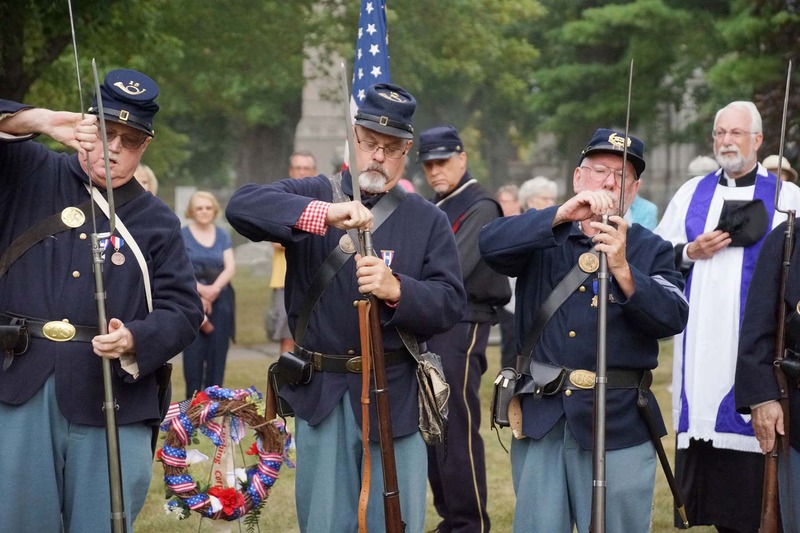 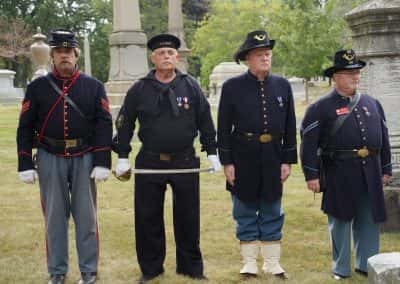 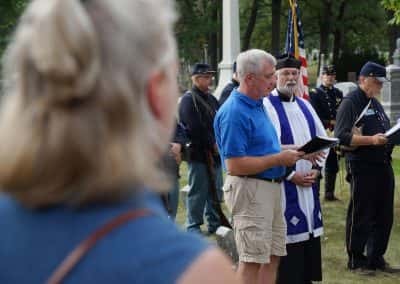 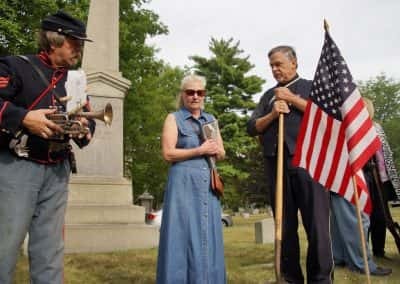 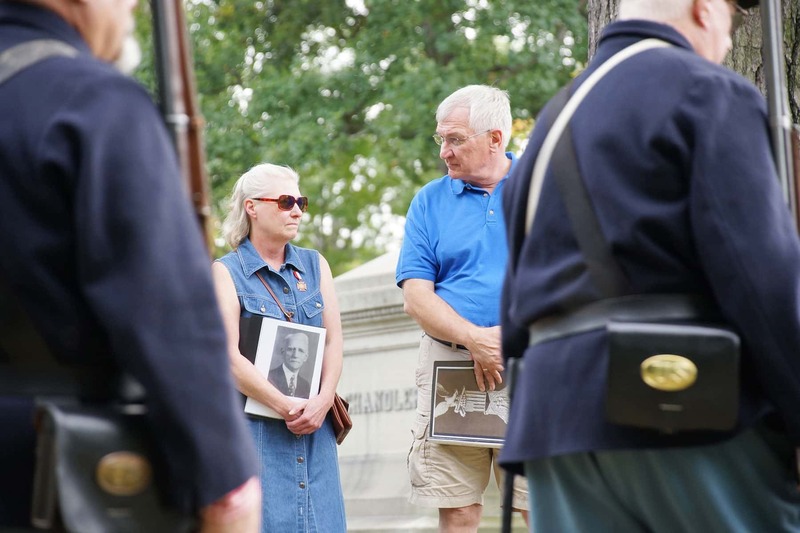 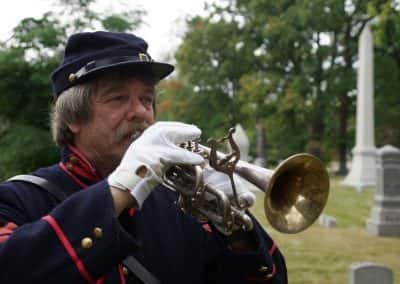 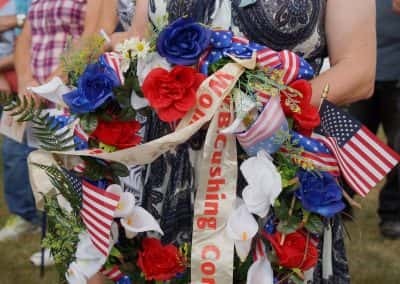 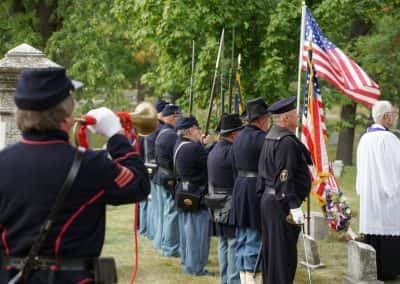 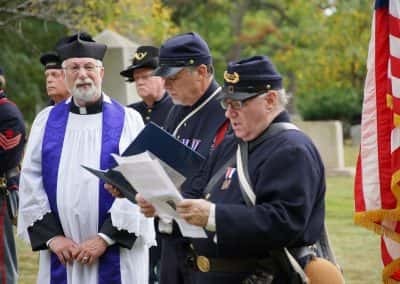 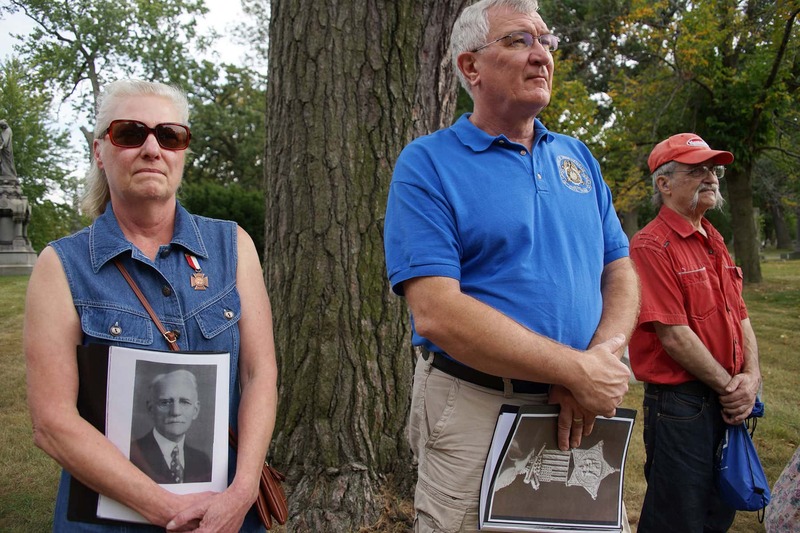 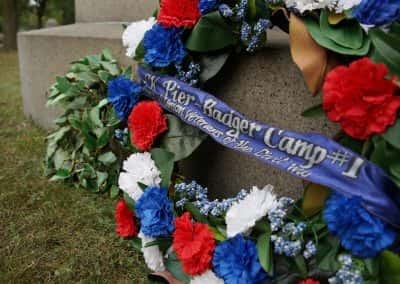 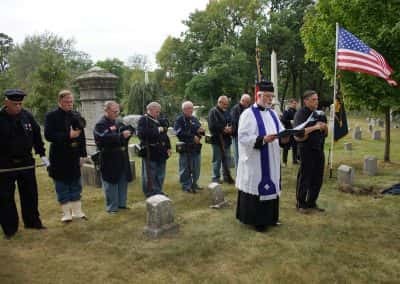 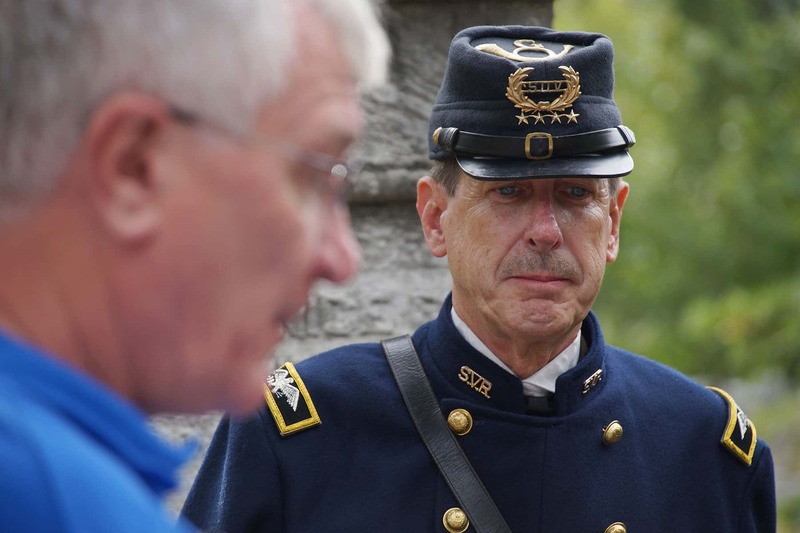 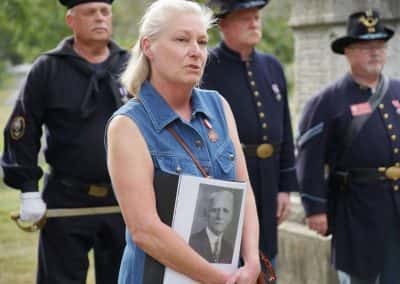 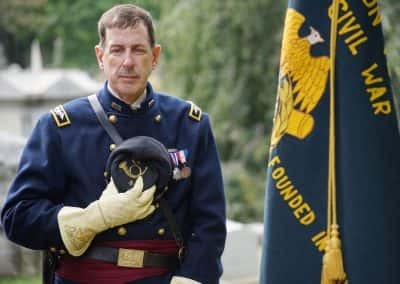 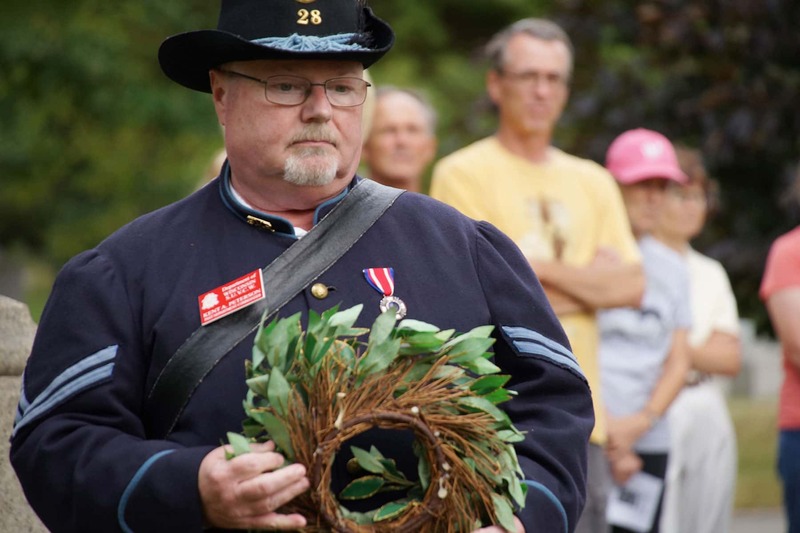 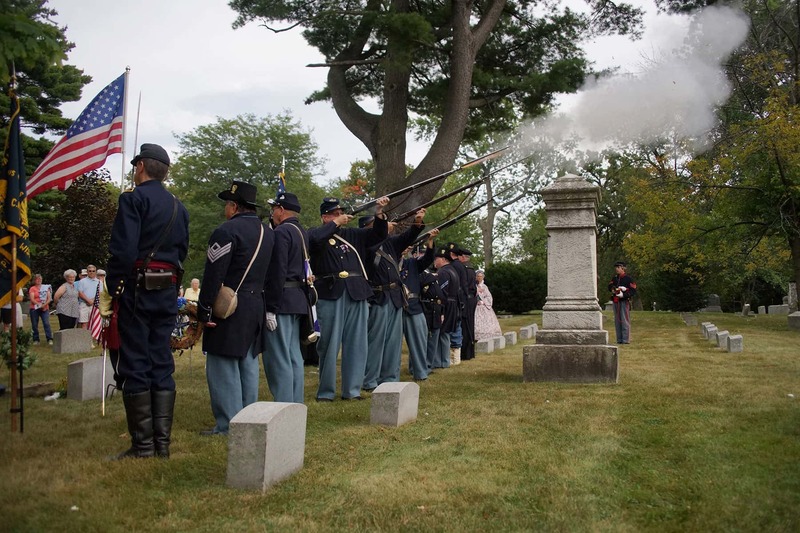 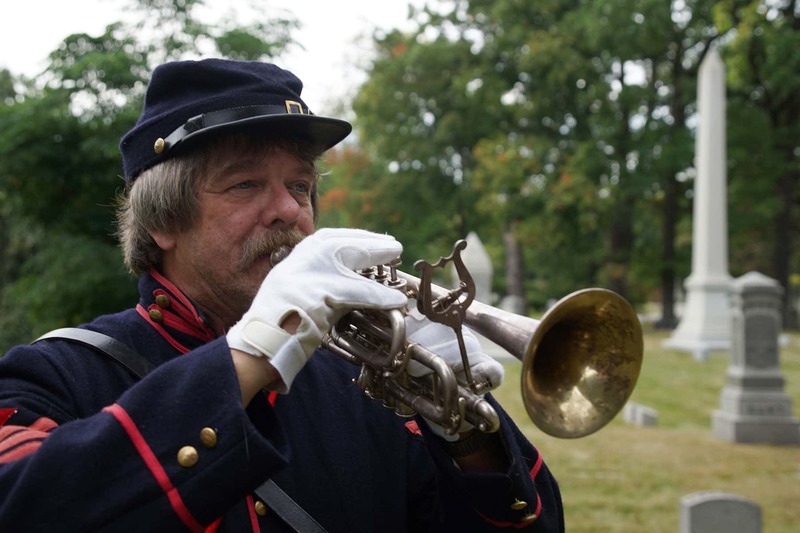 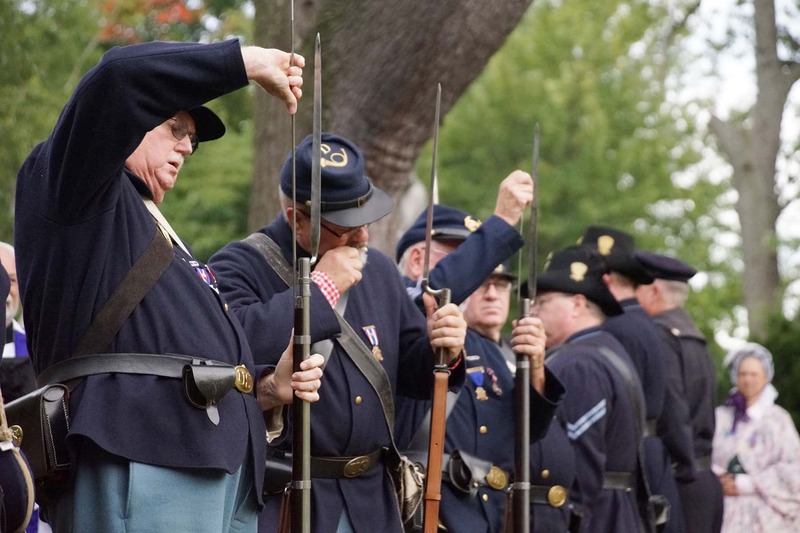 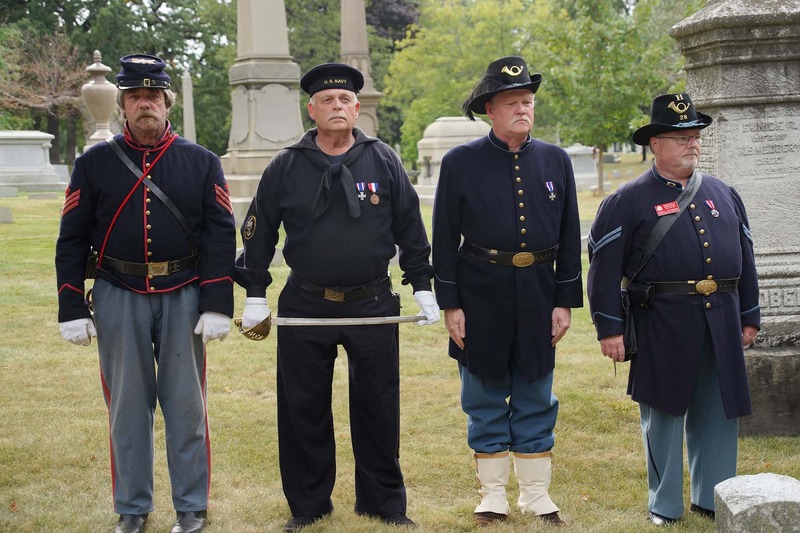 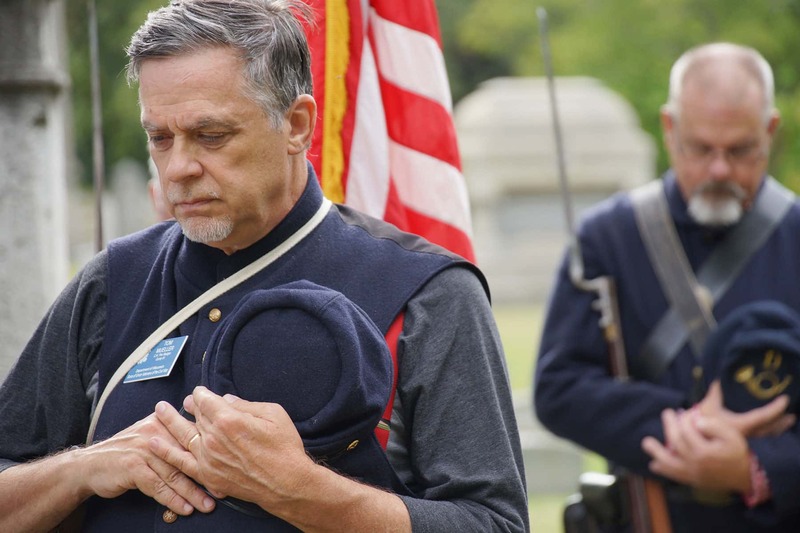 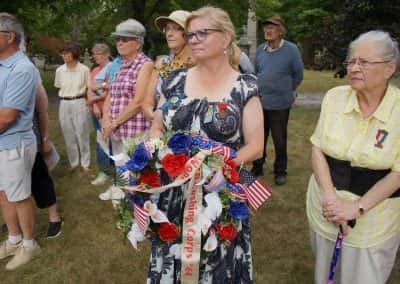 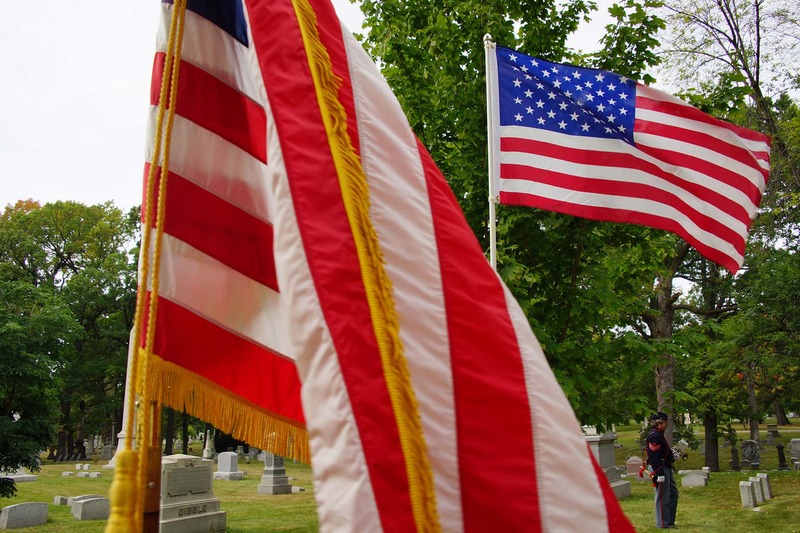 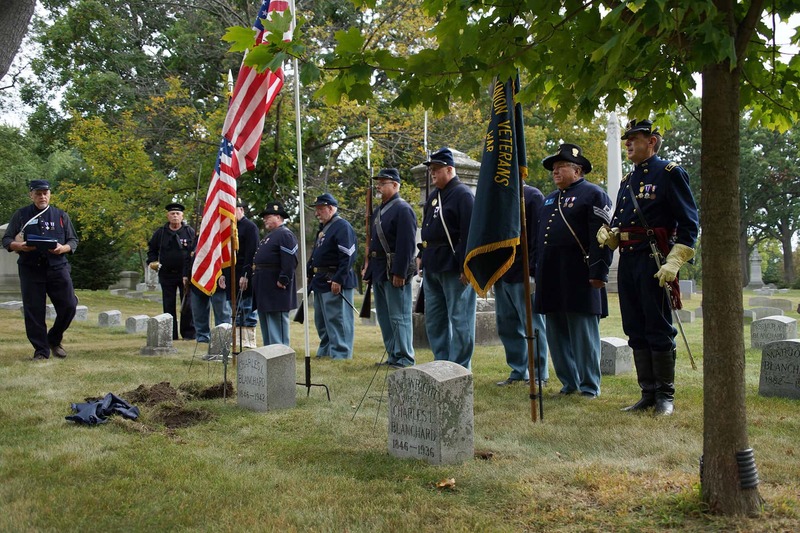 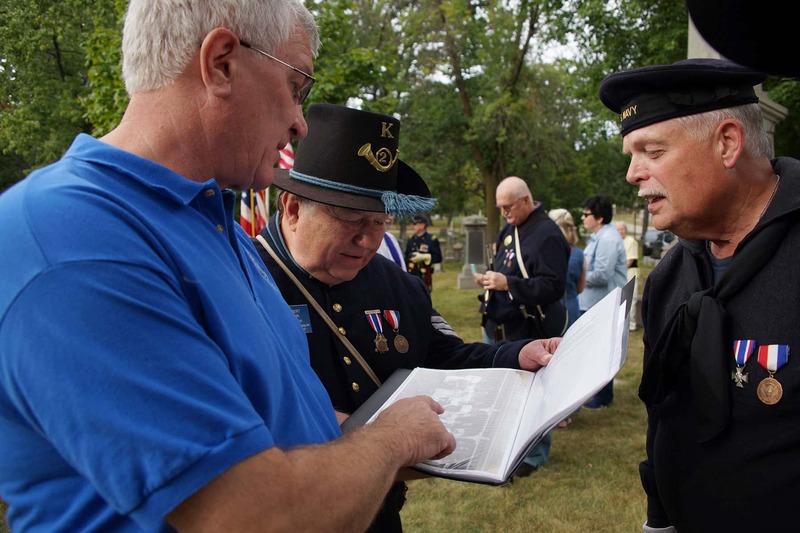 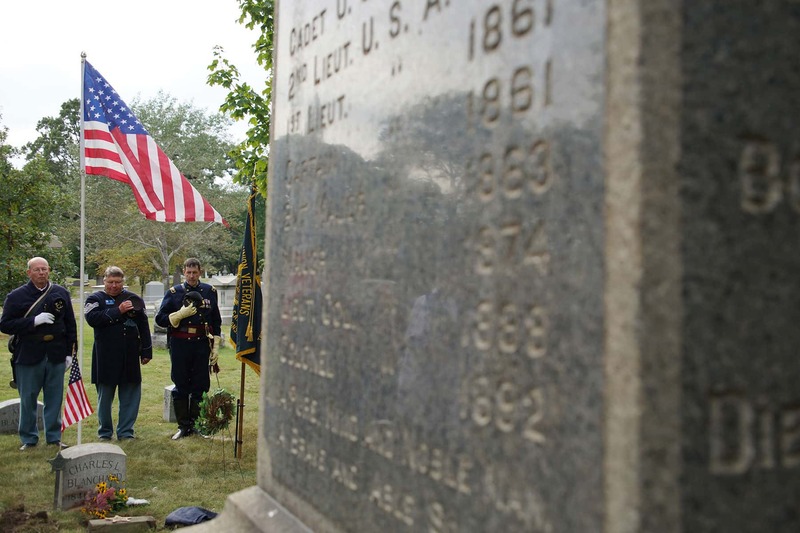 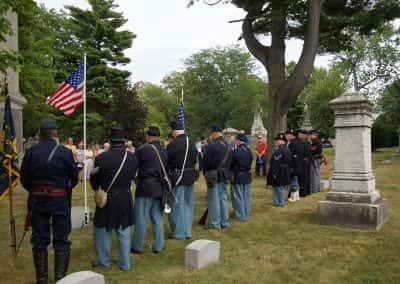 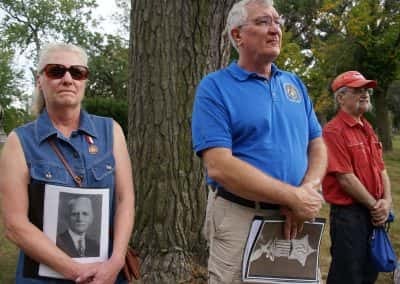 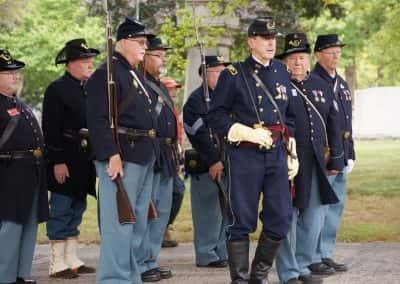 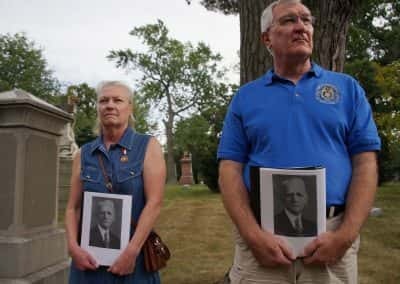 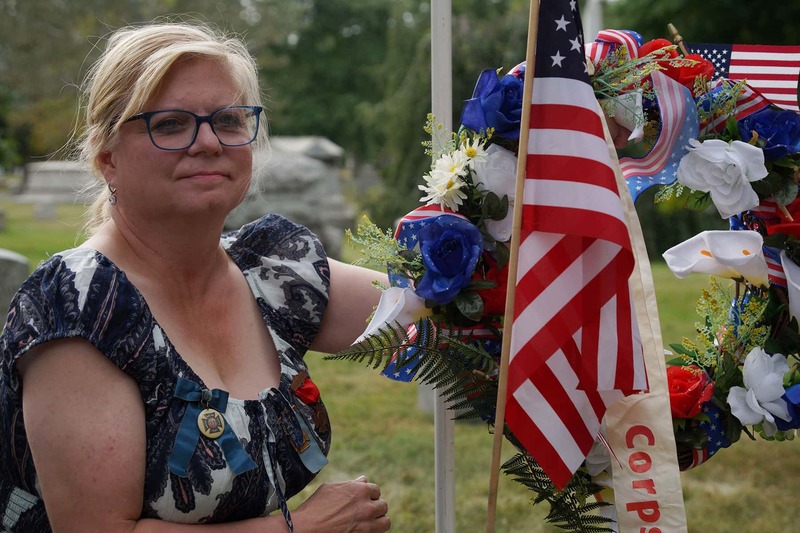 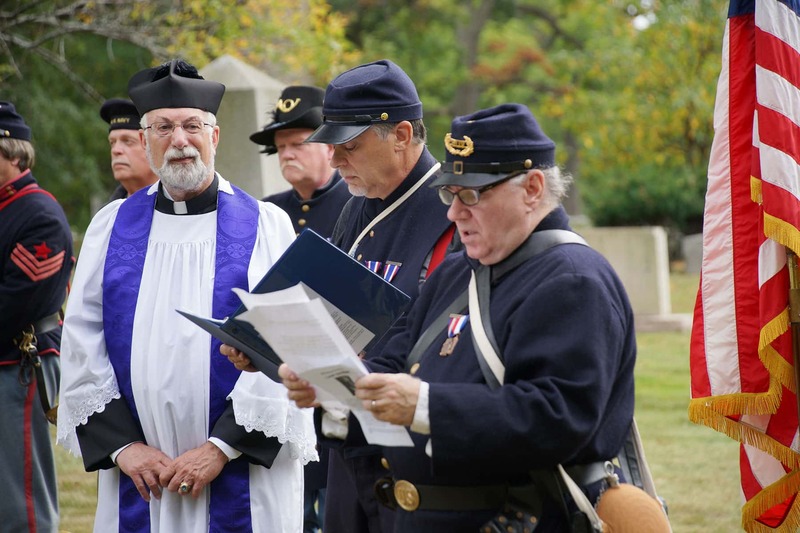 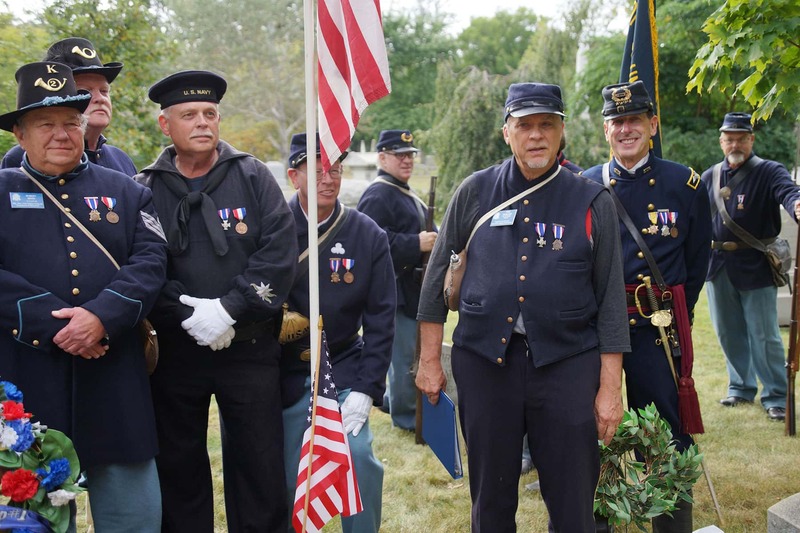 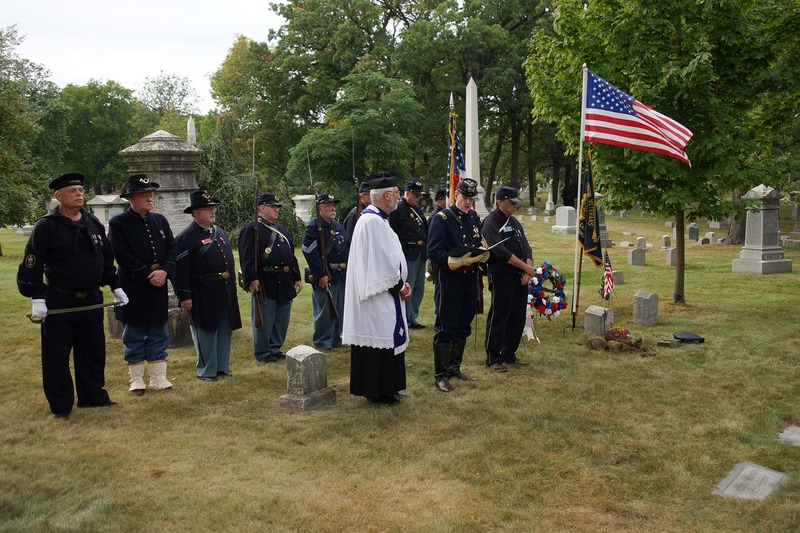 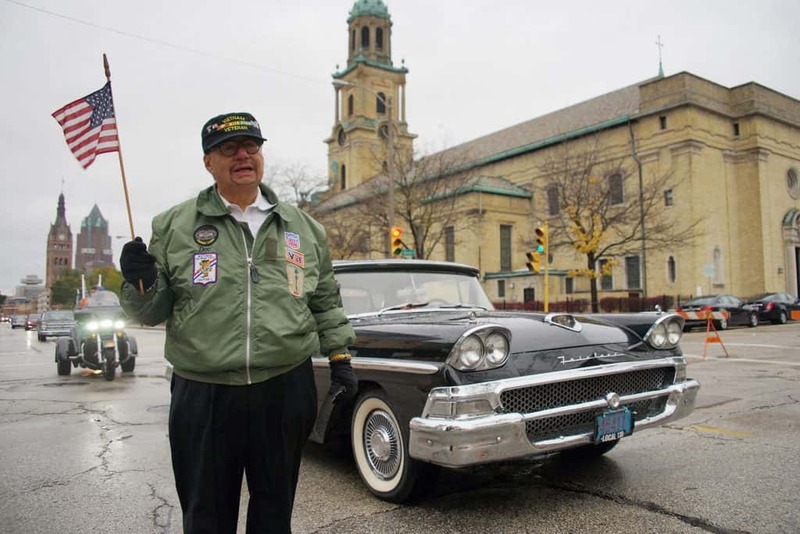 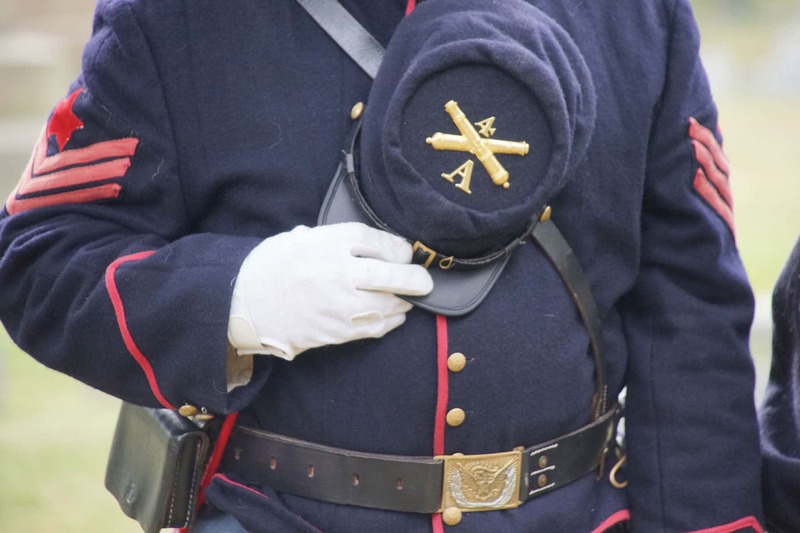 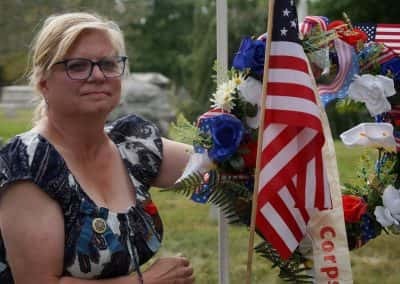 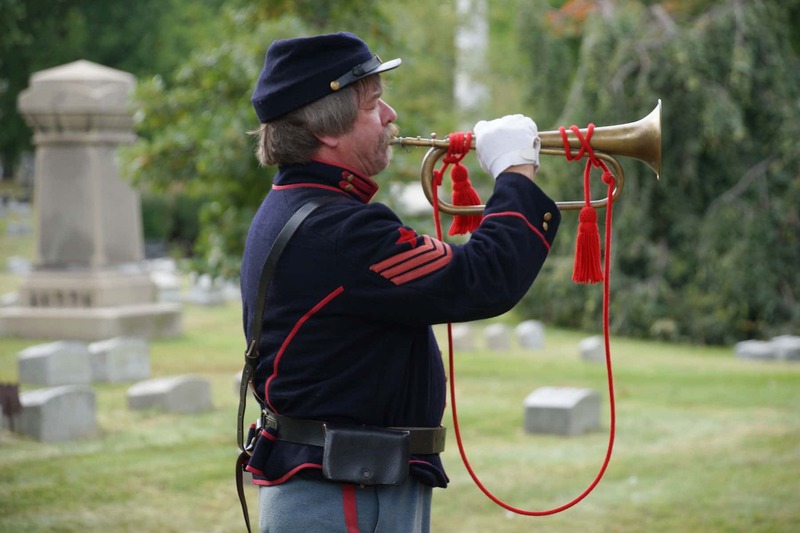 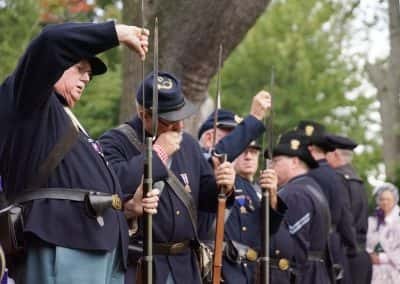 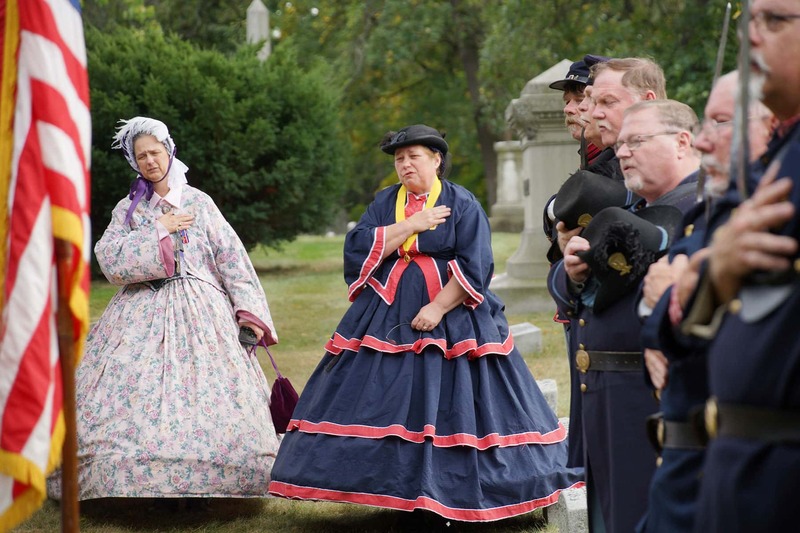 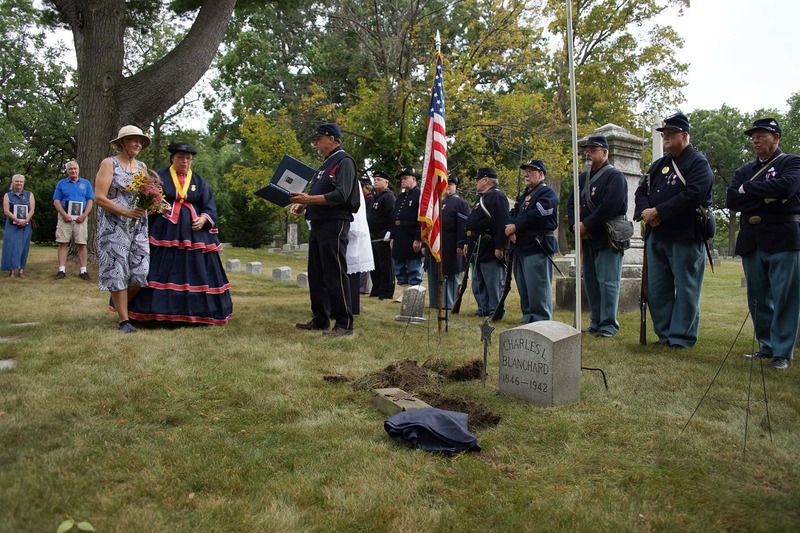 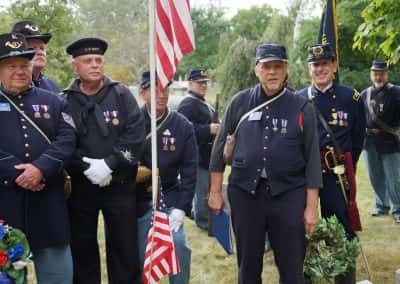 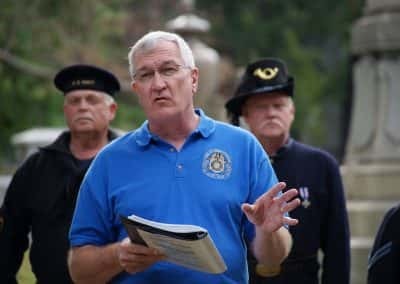 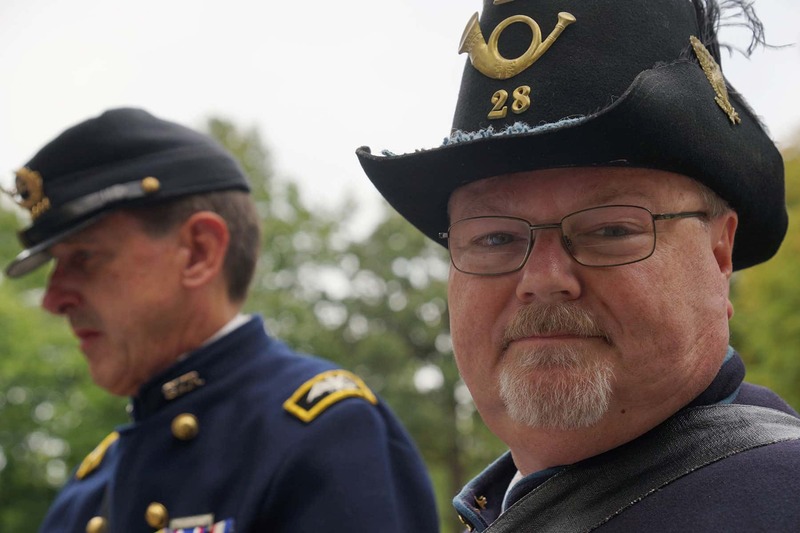 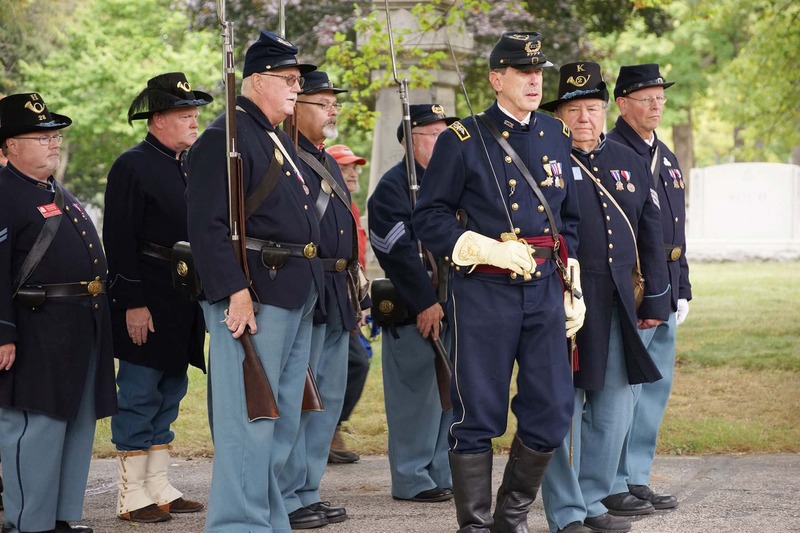 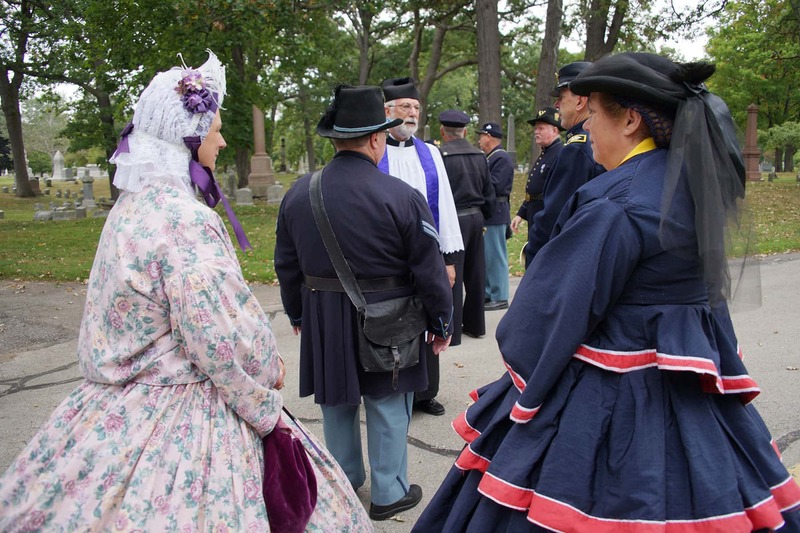 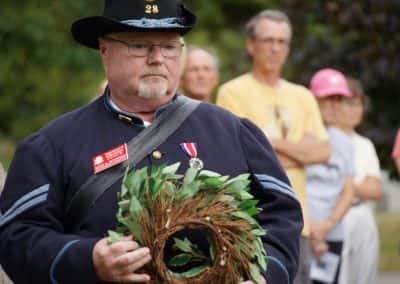 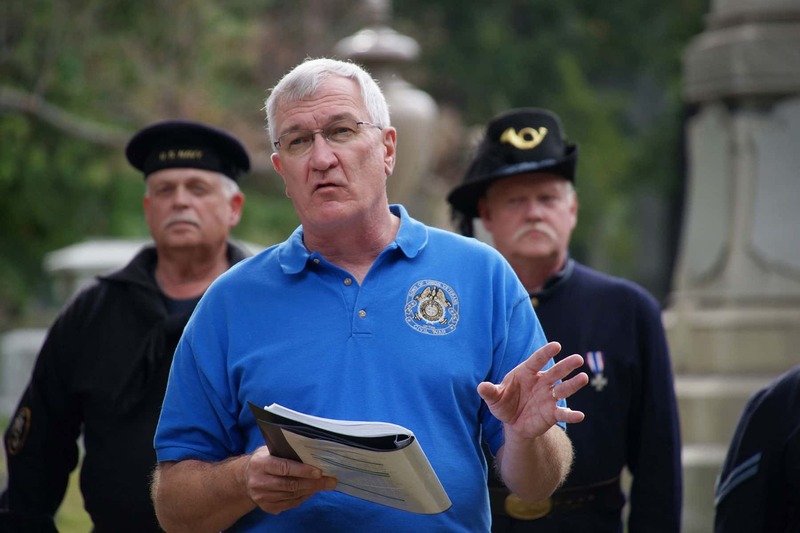 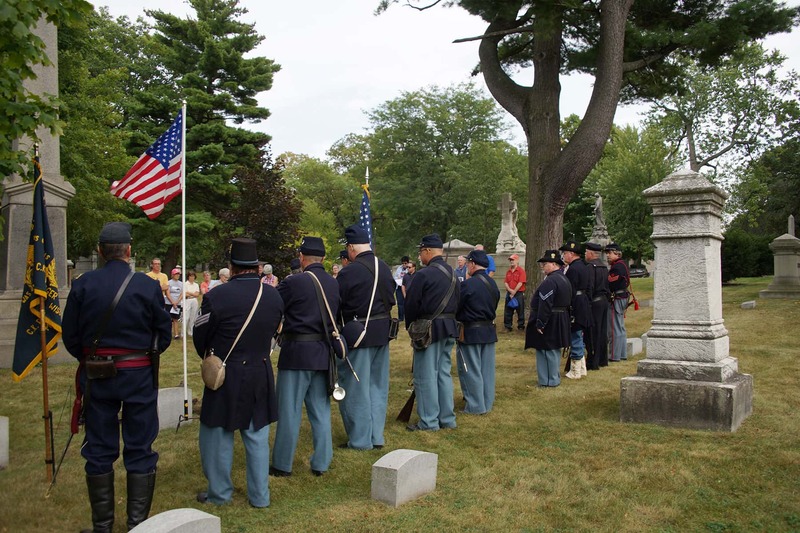 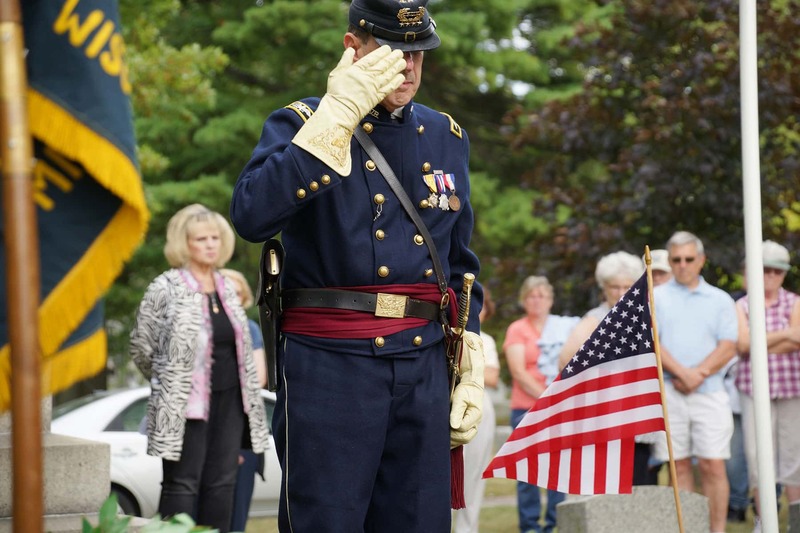 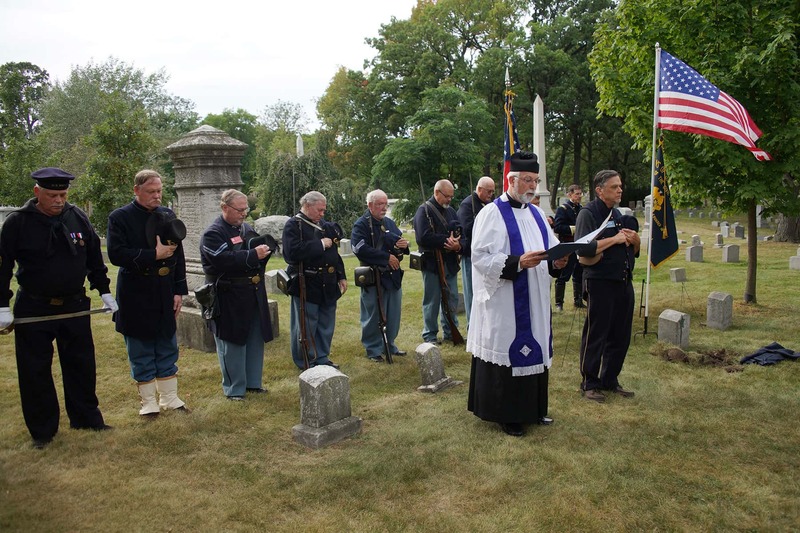 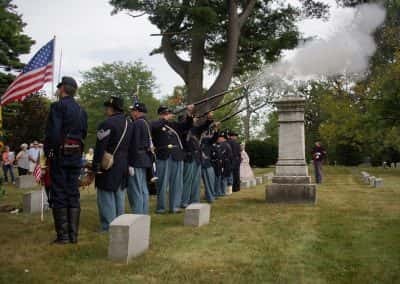 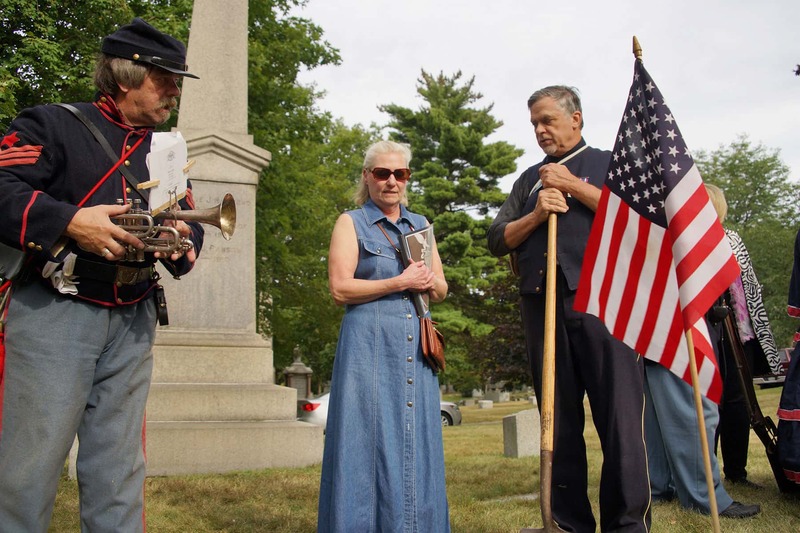 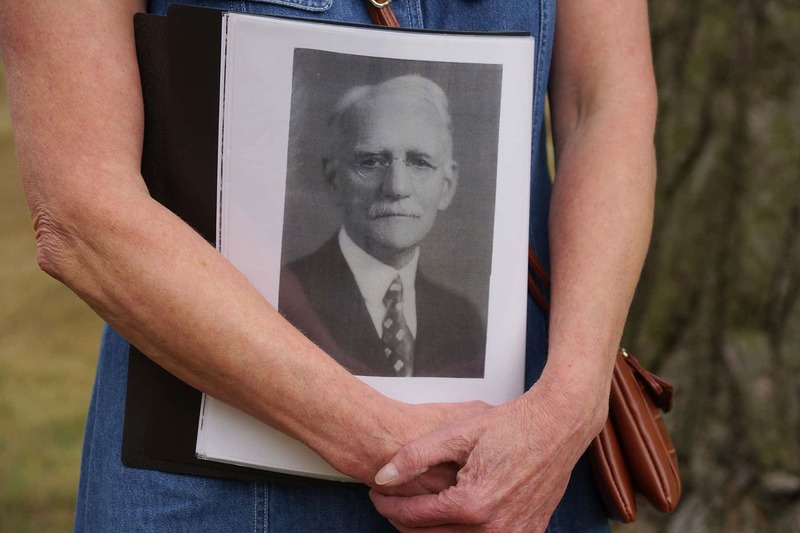 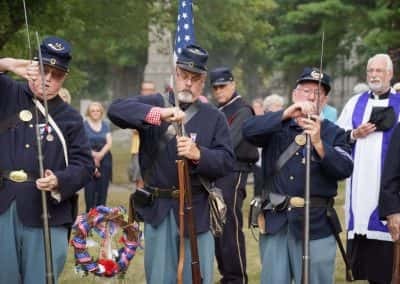 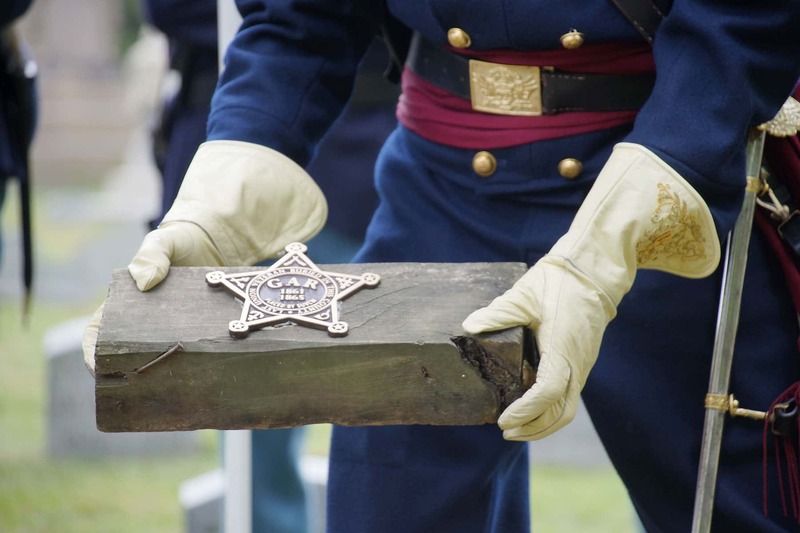 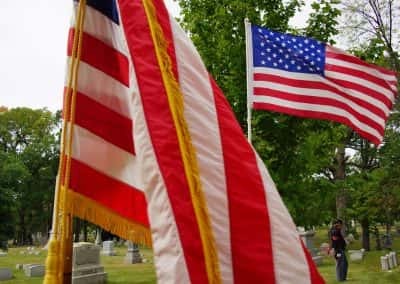 The public was invited to a special ceremony presented by the Sons of Union Veterans of the Civil War (SUVCW) that honored Milwaukee County’s last living Civil War veteran, Charles L. Blanchard, with a special marker at Forest Home Cemetery on September 17. 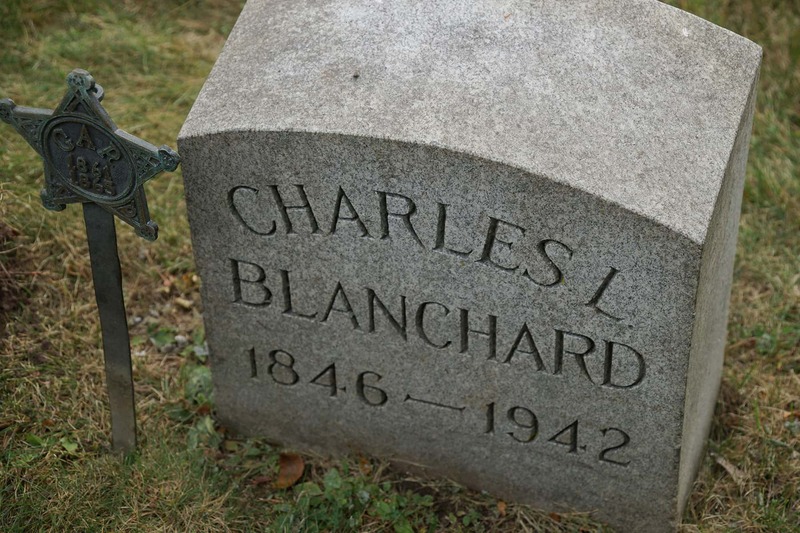 Blanchard was a private in Company D of the 40th Wisconsin Infantry, a unit that guarded supply lines around Memphis, Tennessee. 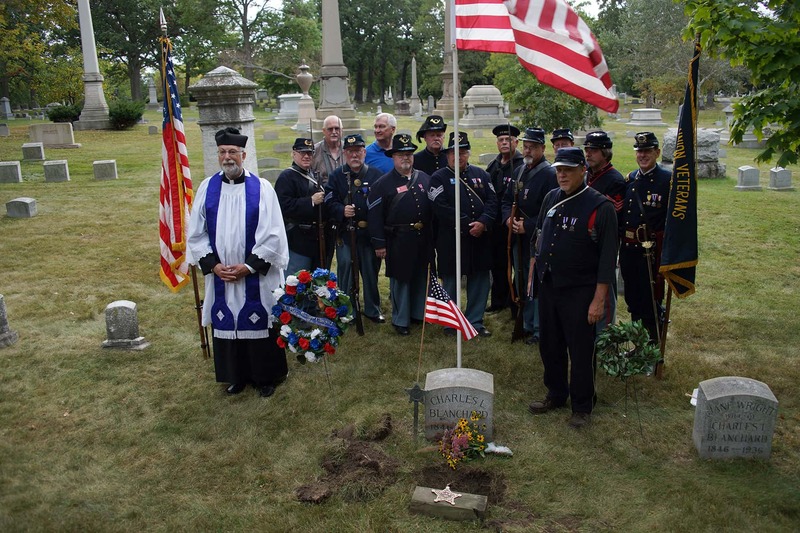 He served for four months in 1864 at age 18, and went on to live until the start of World War II at 96 years old. 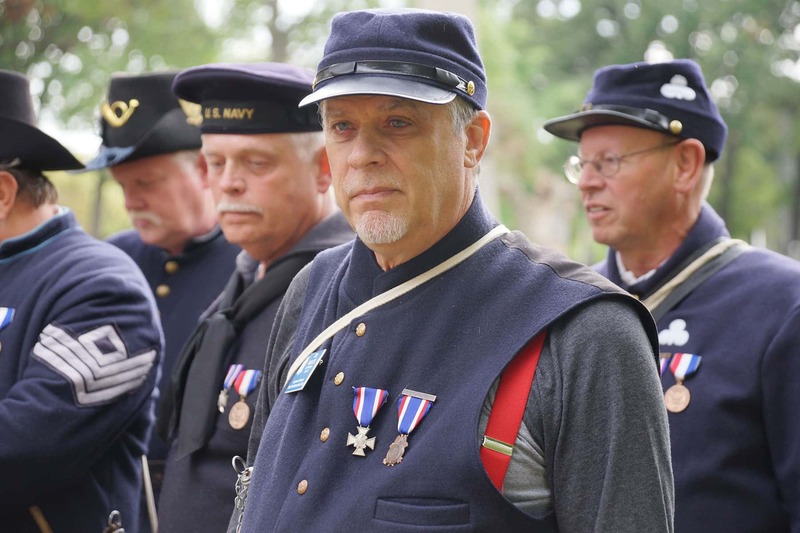 More than 91,000 men from Wisconsin served in the Civil War, of which 12,000 died. 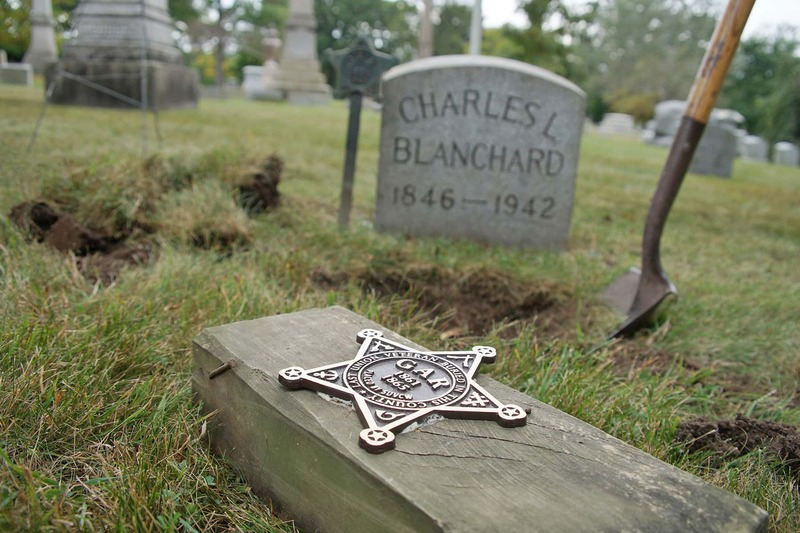 Milwaukee County has 7,600 Civil War graves, and Blanchard was the last veteran to be buried on September 5, 1942. 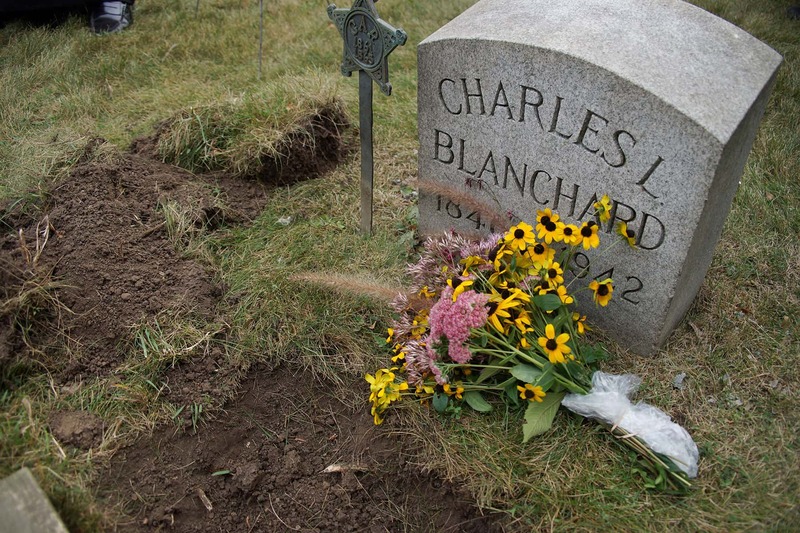 In 1871, Blanchard married and eventually raised a family of two daughters and one son. 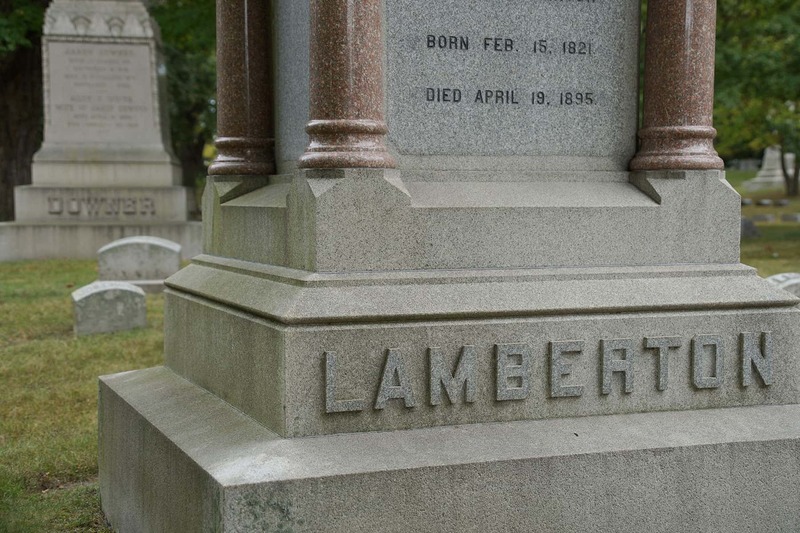 He went on to start the Standard Paper Company in Milwaukee in 1883. 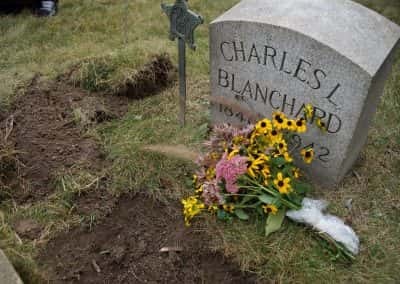 At his tombstone in Forest Home Cemetery, historian Marge Berres explained that from her research she discovered Blanchard had talked about his 1859 trip to the Wisconsin State Fair. 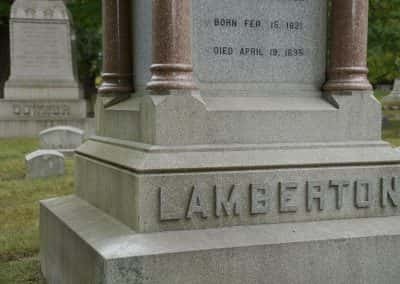 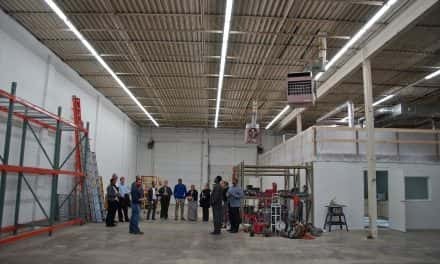 It was there he saw an Illinois lawyer named Abraham Lincoln speak about agriculture, in his only trip to Milwaukee before becoming President. 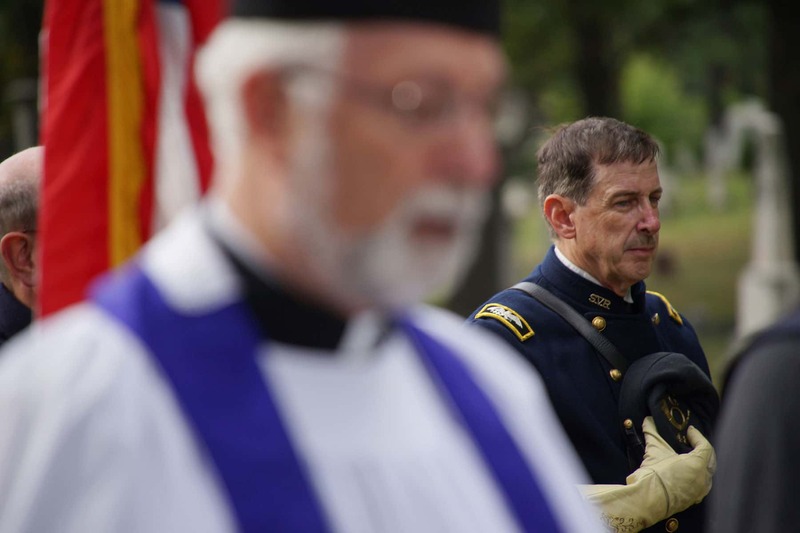 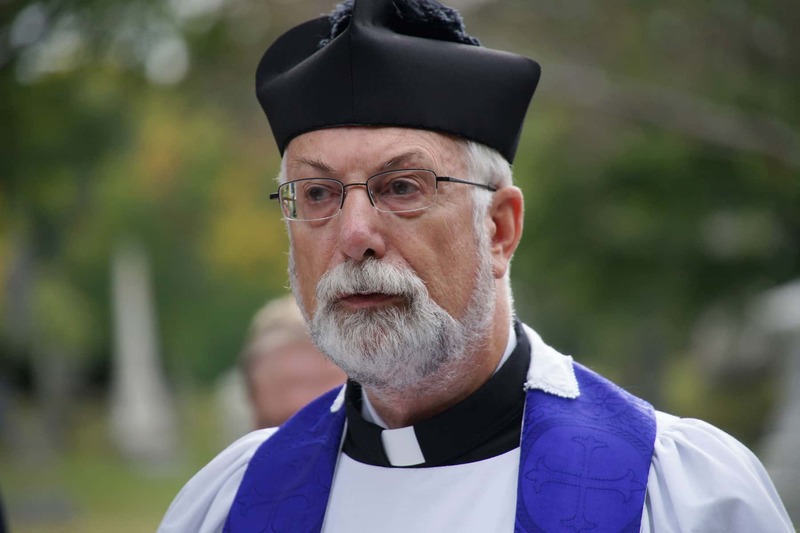 As part of the dedication ceremony, Chaplain Dean J. Collins invoked the Divine Blessing from the traditional tombstone dedication. 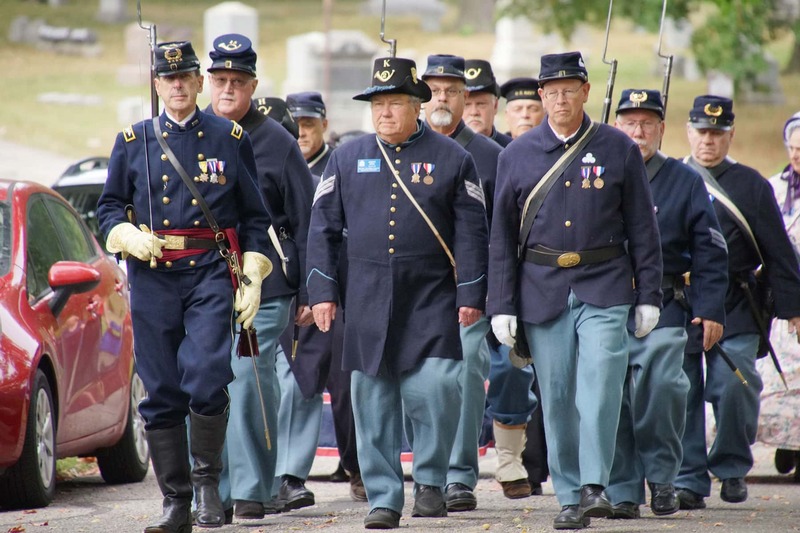 The ritual is based on what the Grand Army of the Republic (GAR) itself used. 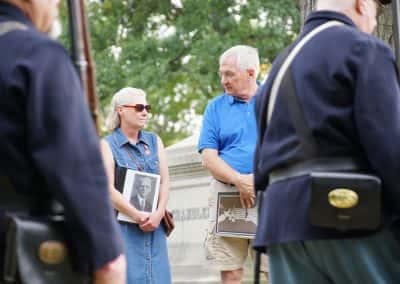 The very words were repeated many times on the hallowed ground of Forest Home Cemetery in the late 1800s and early 1900s, as old soldiers buried their comrades. 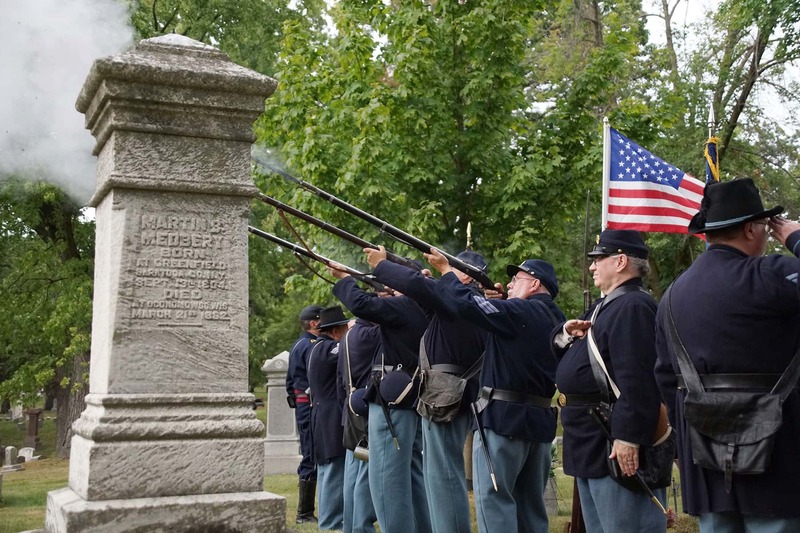 Arthur MacArthur Jr., father of General Douglas MacArthur, served in the 24th Wisconsin Infantry along with the great-grandfather of Chaplain Collins. 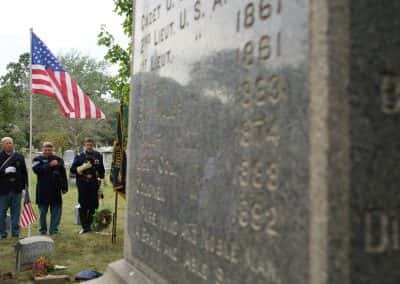 MacArthur is credited with coining the Wisconsin state slogan “On Wisconsin.” It was his rally cry while leading men up Missionary Ridge at the battle of Chattanooga, a feat he would later receive the Medal of Honor for. 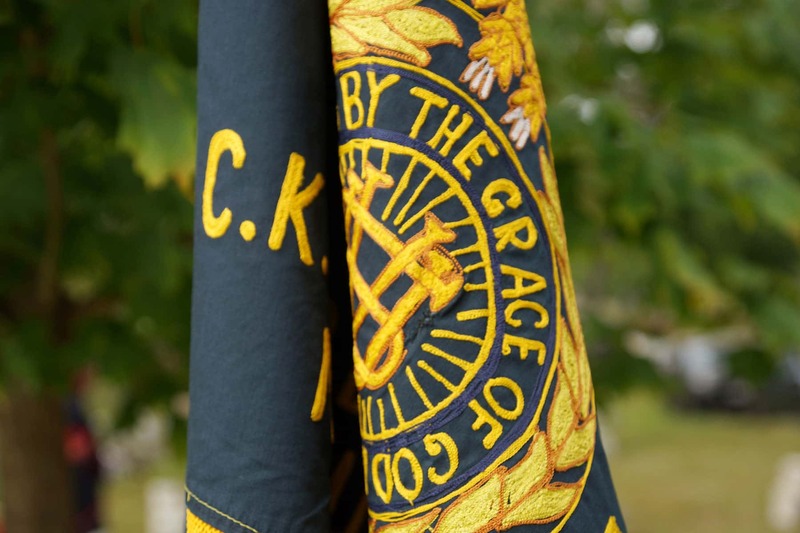 Three men in the 40th Regiment were wounded. 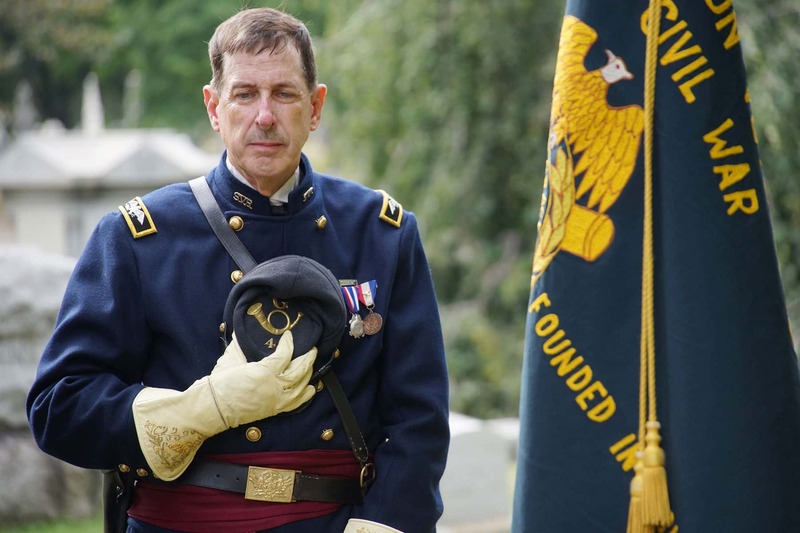 The top general in Memphis was Major General Washburn, a future Wisconsin governor. 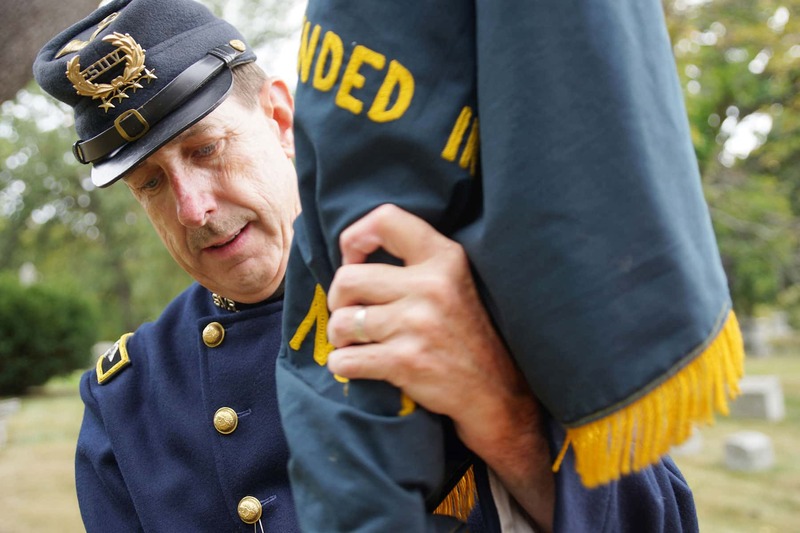 In the raid, Washburn was evacuated by his troops and disappeared into the night wearing only his nightshirt. 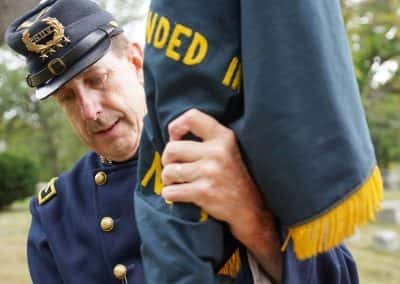 The Confederates seized his uniform but sent it back later. 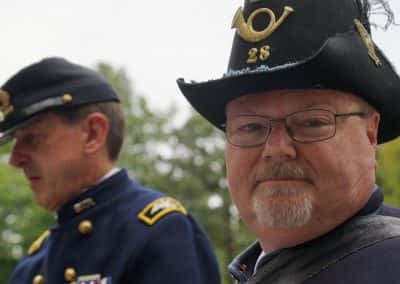 A short, one-way street in downtown Memphis displays the sign “General Washburnʼs Escape Alley” because of the bizarre event involving the Wisconsinite. 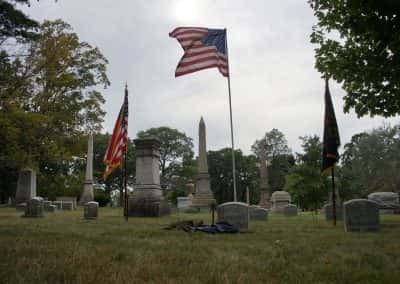 There are dozens of Civil War veterans at Forest Home Cemetery who do not have a tombstone, or whose tombstone has decayed so badly that is unreadable. 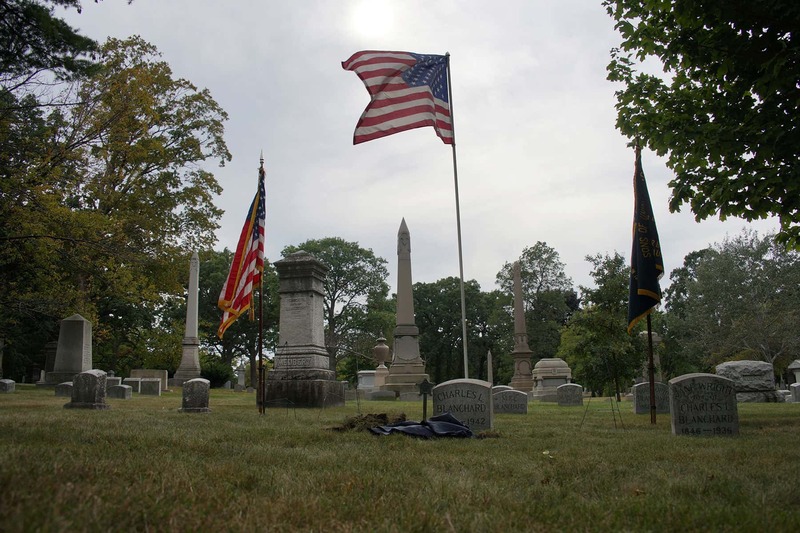 The cemetery’s preservation foundation accepts donations for the installation of replacement tombstones. 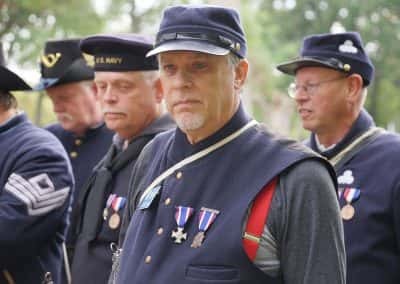 The Sons of Union Veterans of the Civil War (SUVCW) is a volunteer, non-profit, patriotic and educational organization similar to the Grand Army of the Republic (GAR) and is officially recognized as its legal successor. 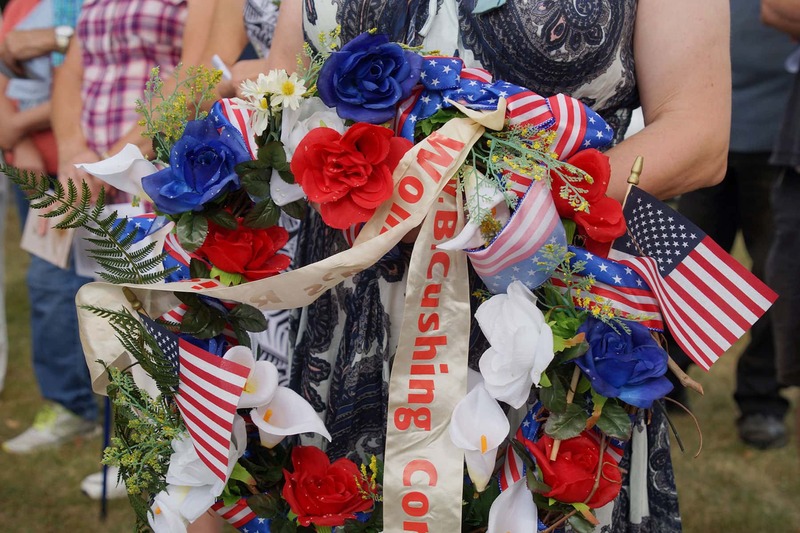 Founded in 1881 by sons of Civil War veterans, the SUVCW today has over 6,000 members.